If you're looking for someone who is not afraid to be different and dares to take risks on the red carpet, you can count on Miriam Yeung (楊千嬅). Miriam Yeung (楊千嬅) attended 15th Global Chinese Channel V Awards on April 16, 2011 wearing a mustard colored dress from Stéphane Rolland Haute Couture Spring/Summer 2011. 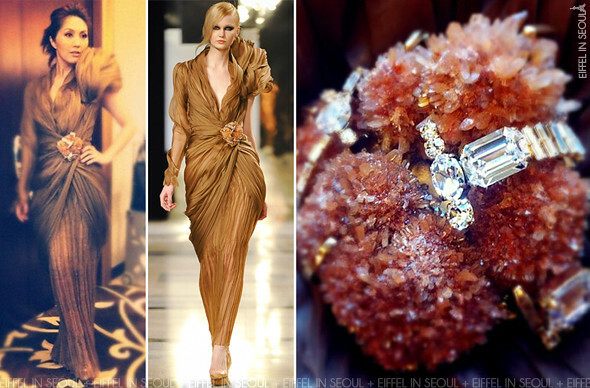 I absolutely adore the stunning jewelery on the Crumpled Foundation Organza Draped Long Dress. The following day, she wore 2 Haute Couture dresses to the 30th Hong Kong Film Awards held at the Hong Kong Cultural Centre on April 17, 2011. Wearing another look from Stéphane Rolland. The Black Grain de Poudre and Gazard Long Dress was my favorite out of the 3 outfits. Opting for contrasting jeweleries to complete her stunning outfit. During the award show, she picked out Jean Paul Gaultier Bazooka dress from Haute Couture Spring/Summer 2011. Completing the look with a silver necklace as opposed to the black one on the runway. In Hollywood, it's probably Beyonce, Katy Perry, Lady GaGa, Nicki Minaj and Rihanna (well, those few) who would dress in Haute Couture on the red carpet. I am definitely happy to see Miriam Yeung (楊千嬅), dressing differently from others Asian celebrities. It is very refreshing!